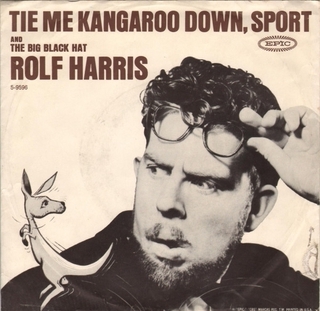 "Tie Me Kangaroo Down, Sport" is a song written by Australian singer Rolf Harris in 1957 which became a hit around the world in the 1960s in two recordings (1960 in Australia, New Zealand and the United Kingdom for the original, and 1963 with a re-recording of his song in the United States). Inspired by Harry Belafonte's calypsos, it is about an Australian stockman on his deathbed. The song is one of the best-known and most successful Australian songs. Harris originally offered four unknown Australian backing musicians 10% of the royalties for the song in 1960, but they decided to take a recording fee of £28 among them because they thought the song would be a flop. The recording peaked at No. 1 in the Australian charts and was a Top 10 hit in the UK in 1960. 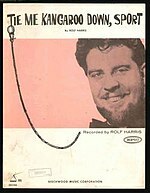 In 1963, Harris re-recorded the song in the UK with George Martin as producer, and this remake of the song reached No. 3 on the US Billboard Hot 100 chart and spent three weeks atop the easy listening chart in 1963. Harris re-recorded his song a second time along with The Wiggles in 2000 with the introductory verse and the verse mentioning the stockman's death omitted. It is still popular today as a children's song. The distinctive sound of Harris's original recording was achieved by the use of an instrument of his own design called the "wobble board"—a two-by-three-foot piece of hardboard. Other versions were recorded by Connie Francis (for her album Connie Francis and The Kids Next Door 1966) and by Pat Boone. In Harris's version, a dying Australian stockman instructs his friends to take care of his affairs when he is gone. The first of these is to watch his wallabies feed, then to tie his kangaroo down, since they jump around (which is the chorus). "Sport" is an Australian term of address, alluding to "good sport", which often, as in this case, praises someone for carrying out a small favour one is asking of them. The lyrics mention animals and objects associated with Australia, including cockatoos, koalas, platypuses, and didgeridoos. His last dying wish is "Tan me hide when I'm dead, Fred". By the end of the song, the stockman has died and his wish has been carried out: "So we tanned his hide when he died, Clyde, and that's it hanging on the shed". Many parodies, variations, and versions tailored for different countries exist of the song, and Harris performs excerpts from some of them on a 1969 live album released only in the UK called Rolf Harris Live at the Talk of the Town (EMI Columbia SCX 6313). He recorded a version with The Beatles on 18 December 1963 for the BBC programme From Us To You Say The Beatles in which each Beatle is included in the lyrics. It was broadcast on 26 December. The song is performed by Elvis Costello in a 2003 episode of Frasier. Costello, playing the character of Ben, played the song in the Season 10 episode, "Farewell, Nervosa" accompanied by the character of Niles Crane playing maracas. The stockman thus emancipates his indigenous offsiders at his death, when they are "of no further use" to him. This verse does not feature in 21st-century versions of the song and, in a 2006 interview, Harris expressed regret about the racist nature of the original lyrics. But let me welcome you all to the Games. ^ "45cat.com". 45cat.com. Retrieved 26 January 2019. ^ A. B. Paterson. "The Old Bush Songs" (TXT). Gutenberg.net.au. Retrieved 27 September 2016. ^ "The Beatles' BBC radio recordings". The Beatles Bible. Retrieved 27 September 2016. ^ Thomas, Athol (12 December 1964). "In Western Australia This Week: Card Falls Wrongly for Country Party". The Canberra Times. National Library of Australia. p. 2. Retrieved 30 August 2013. ^ Renee Switzer, Rolf's lyrics 'a sign of the times', The Age, 6 December 2006. This page was last edited on 1 February 2019, at 19:06 (UTC).